There is joy in the photos in Ballad: people are shown living the lives they want to live, and loving each other through them. But there is a darker side to the photos, one that lesser photographers may have shied away from, and one that Goldin’s insistence on honesty drew her to powerfully. Most of the people in the photographs in Ballad died in the 1990s, and Goldin’s photos capture the portents of that when they show a group of people being slowly destroyed by heroin, domestic violence, and the AIDS epidemic. As a retrospective look at these people, Ballad takes on a new and more somber meaning. 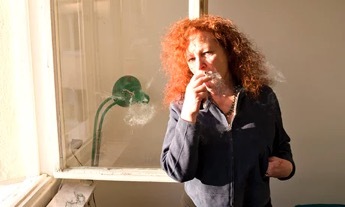 “The Ballad of Sexual Dependency is the diary I let people read,” Goldin wrote about her work. “The diary is my form of control over my life. It allows me to obsessively record every detail. It enables me to remember.” While at its inception, Ballad was made for and shown to Goldin’s friends and many of the subjects of its own photographs, it now serves as a memorial. The slideshow that Goldin ran by hand on a slide projector several times for her friends before it premiered at the 1985 Whitney Biennial has become a book that honors, mourns, and memorializes the people who sat for Goldin’s camera and watched the work develop. Stay connected with OURS news and updates!